Pasig City gives premium on the cleanliness of the community and the welfare of its residents. SCHICK’s advocacy campaign, Suaveng Ahit, Gwapong Schick Barangay Tour, found this for a fact as it reached its last leg on September 30 in Barangay Kalawaan, Pasig City, which was hailed as “Pinakagwapong Barangay” together with the dance diva, Regine Tolentino. PINAKAGWAPONG BARANGAY. All-out support from Schick's team led by Marketing Manager Cara Ramirez-Tecson and dance diva Regine Tolentino during the last leg of Suaveng Ahit, Gwapong Schick Barangay Tour held at Barangay Kalawaan, Pasig City. Schick, one of the country’s most trusted brands for effective grooming, started this advocacy barangay tour in December 2012. It aims to promote proper personal grooming and also cleanliness in the community, for the ‘Gwapong Mamamayan’ which is about personal grooming, Schick provided free haircut and shaving services to the residents of the areas we visited. Thousands of samples of Schick Exacta2 Disposables were given away. For Gwapong Syudad, we have worked with the Barangay of the community and promoted maintaining cleanliness of the surroundings. The barangay caravan got under way first to Salamalabanan Subdivision in Imus Cavite, then of Antipolo, Muntinlupa, Novaliches, Caloocan, and Pasig City. The caravan held several activities such as three-on-three basketball game, a free-throw and half-court shootout, and a dance showdown that promoted sportsmanship among the participants. Barangay Kalawaan, Pasig City, was awarded the best-looking barangay because of its liveliness despite its dense population. Its busy streets proved that the barangay was a winner, together with its officials who helped achieve peace and order as well as healthy lifestyle. “Unang-una nagpapasalamat po ako sa programang SCHICK dahil kami ang napilibilang Pinaka-gwapong Barangay,” said Barangay Kalawaan Captain Jaime “Jimmy” Lee. “Maraming tao ang natulungan at nakinabang dito sa aming barangay lalo na ang SAKTODA, added Lee. Schick has always believed that being well groomed boosts not just physical but also mental wellness, and hence makes for a more confident community. “We plan to do this event through our distributors across Philippines and have their own mini barangay tour of the Suaveng Ahit, Gwapong Schick,” said stated SCHICK Marketing Manager Cara Ramirez-Tecson. “We believe in its advocacy of promoting proper personal grooming while ensuring that we keep the community in mind as well when it comes to wellness and cleanliness. This activity also enables us to improve our distribution in areas we have opportunities since it includes merchandising blitz and sari-sari promotions that help our brand, Schick be more accessible to our consumers. SCHICK AWARDS LED TV. 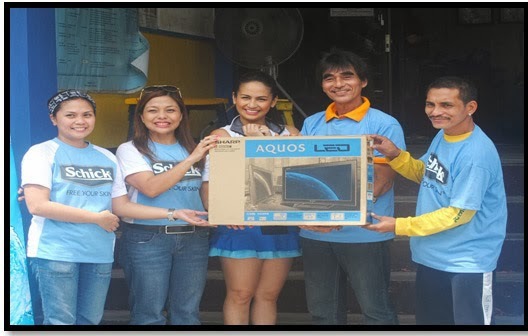 Marketing Manager Cara Ramirez Tecson (second from left) together with dancing diva Regine Tolentino (third from left) hand over the LED TV to Barangay Kalawaan, Pasig City SAKTODA, as the “Pinakagwapong Barangay”. For more information on other tours, prizes, and promos, visit Schick’s Facebook page at https://www.facebook.com/schick.ph. pogi points talaga :D Oh well ... sana magkaroon din dito sa Laguna.. I have seen a lot of hairy people around here...they could use a good Schick :D lol!! !